This is a beautiful compass is made for those who desire them in stainless steel and chromed finish. This is a pocket compass suitable for those who want to carry it along when they go out shopping or working to check their auspicious directions. Our Feng Shui Scholars are always advising feng shui enthusiasts to never rely their compass directions by observing how the sun rises or sets, as it will make all enhancement and cures go incorrect. Classical Feng Shui places great emphasis on directional and locational influences. 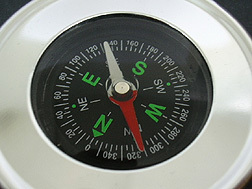 A compass is the most fundamental necessary tool to determine these directions. This reliable compass with appropriate directional degrees are suitable for applications of both Eight Mansion(Ba Zhai) and Flying Star (Xuan Kong Fei Xing) Feng Shui for master practioners who do not read chinese. The needle quality is excellent and it provides accurate and stable reading. This high quality compass is suitable for those practising classical compass school feng shui, especially useful for landform feng shui, mountain audits and flying stars analysis. Magnetic needle quality - this is the most important feature as the accuracy of feng shui readings depends on the quality of needle. Our manufacturer uses the best type of stainless steel metal to make their needle. Its magnetic field is very strong and the reliability ever-lasting. Accuracy of partitions - every single degree counts. Our compass has a very strict specification on partitions and degree readings within the outer ring when you are taking your readings. The red needle always point to the north for your reference.